The 38' Fairline Targa 2014 is a fully equipped pocket cruiser! : Atlantic Yacht & Ship, Inc. The 38′ Fairline Targa 2014 is recently listed and easy to see at our Dania Beach docks! The Targa 38 is the H.T. Express that sets the benchmark for quality construction and speed with efficiency! As you step aboard “Jerri Lu,” you can see that this boat is a crowd pleaser. The cockpit can seat 8 with ease and comfort. Stored behind the seating is an easily accessible table for dining, cocktails and games. The helmsman is set apart with its own station. All the command systems are within easy reach. Not to mention, an electric hard top enhances the view and sun rays. Furthermore, the accommodations below fit guests and owners in private accommodations. There is plenty of dining and lounge space in between. A full head and galley add to all the comforts of home. Additionally, “Jerri Lu” has Twin D-6 370 Volvo Pentas with low hours. Joystick Controls by Volvo ease maneuverability when docking. 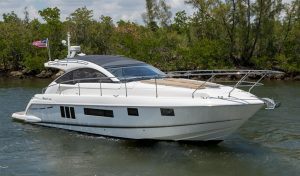 In essence, this is truly a fully equipped “Pocket Cruiser!” Contact Dennis Rhodes or Ed Biggie at Atlantic Yacht & Ship, Inc. for a private showing on the 38′ Fairline Targa 2014 located in Dania Beach, Florida.